But then I asked myself something important. And you should ask yourself this, before you lament about how much work you have ahead. Do I need a new block? What’s a Block Anyway? #What’s a Block Anyway? The concept of ‘block’ writing is one people who use Scrivner may be familiar with. Or maybe if you’ve ever been a part of a writer’s room, breaking down a season of a TV show. The idea is that each index card is it’s own entity.’ Or rather, in the case of WordPress, each paragraph is it’s own entity. This means you can move the paragraphs around, which for paragraphs makes little sense. But for layout? Oh it makes a great deal more sense. A block is, literally, a block you move around until your page looks the way you want it to. Awesome. Why Don’t We Need Them? #Why Don’t We Need Them? Actually the question should be when don’t we need them? Obviously we need blocks. That won’t change. But by default WordPress has quite a number of blocks out of the … block. And that begs the question of when and why do we need to make new﻿ ones? This is a question many developers who have shortcode plugins will be asking themselves, and the realization I stumbled across at WordCamp San Diego is that … a lot of developers don’t need to make new blocks! Because a lot of shortcodes aren’t actually going to be all that necessary in the future. 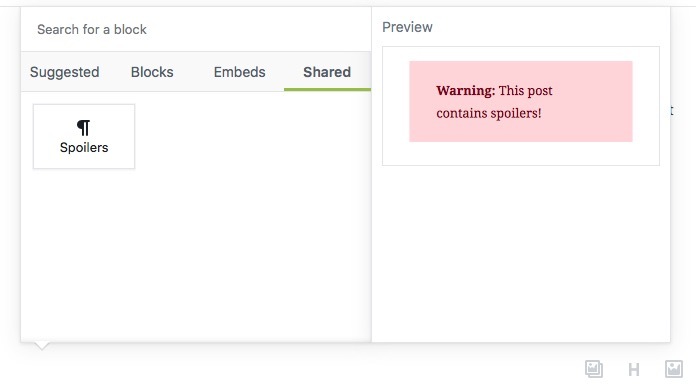 Let’s say you have a WordPress site and it sometimes talks about spoilers. Those would output a simple paragraph that warned people about spoilers. But then I thought …. What if I don’t? Warning: ﻿This post contains spoilers! That’s easy. But what we want is to apply color to it. And that can be done in a number of ways. The easiest would be to use the advanced section in the block editor and add an additional CSS Class of, in this case, alerts. Okay, But Reusing? #Okay, But Reusing? Don’t worry, I didn’t forget. When you hover over a block there are three vertical icons on the right indicating a menu. Click on the menu and you get options and one is to convert it to a shared block. Click on that, give it the name you want, and you’ve created a block! The share icon in the lower right is how you know. Right away you’ll notice you can’t edit the shared block without editing it for everyone. So if you made it “Aaaaaahhh! Spiders!!!! !” everything would change. And that’s not great for everyone. But for a lot of people who just want a simple, repeatable, notice or signature, this is just fine. It won’t spare you having to convert some of your shortcodes to blocks, but it may make life easier for people who don’t want to have to use them in the first place. And that, I think, is a win.